Rob and I had this project in mind for months, but in the last few weeks we have finally finished our display wall in the dining room. We had this big blank wall in the dining room that we wanted to fill with some chunky floating shelves and a few of our prints. Rob made the shelves himself from some spare wood that we had and thought they would be a good setting to display Rob’s vintage camera collection. Having a guitar easily accessible is another bonus! Rob designed two of these prints and the Magpie in the top hat is the work of Jon Turner, one of our favourite artists from Manchester Comic Con. You can check out more of his work here. I struggled to get a good photo of this print (or actually I was too lazy to go and get the good camera instead of using my phone) but I do love this piece Rob made. It reminds us to build our family by design, not by default, and to be intentional with how we want to live our lives. It is a good family motto for us. I am really happy with our display wall, as it is full of things that make us happy, photography, music, art and pretty vintage things! There is also room to add more to the display over the years and would be easy to rotate things on the shelves from time to time. I could see us dressing this up for Christmas or swapping the cameras for other trinkets! The best thing about my home is the garden, no contest. It is basically a small field with old trees and lots of squirrels. Last year I thought I would get lots of gardening projects done whilst I was on maternity leave. That was a mistaken assumption….I did nothing! But even left to it’s own devices, and even in the latter bedraggled stages of winter, the garden still has lots of treasures to discover. Daffodil shoots are rising up, letting me know that Spring is on it’s way. There are also signs that we will have a good bluebell crop this year. I really love all the flowers that appear in Spring and can’t wait to spot the first crocus or snowdrop. My friend’s got me this clever bird feeder for Christmas that ‘frames’ the birds. I was desperate to put it up so I have placed it on this tree for now but I think one of our projects this year will be to set up a proper bird feeding area. The primroses are eeking out, pushing aside the dead leaves that I never got round to sweeping up! But even though it is untidy debris, I think the messy lawn is interesting, especially under the horse-chestnut tree where there is a generous scattering of conker shells. Plus the twigs and leaves are good for wildlife, which is very important to us. I love it when a new animal comes and visits our little wildlife friendly garden, so far we have had; squirrels, birds, a hedgehog, a heron, mice, pheasants, a fox, owls and deer. I really want to entice a badger to come next, any hints on how to do that would be most appreciated! 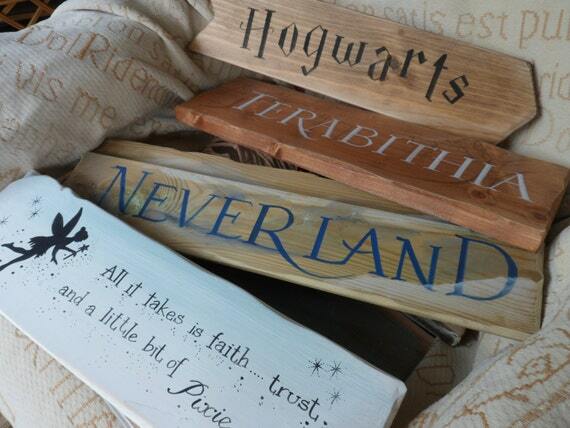 SignsatSimplyWood sell these adorable hand-painted door signs for all of your favourite children’s books, and they only cost £9.50 each plus shipping. 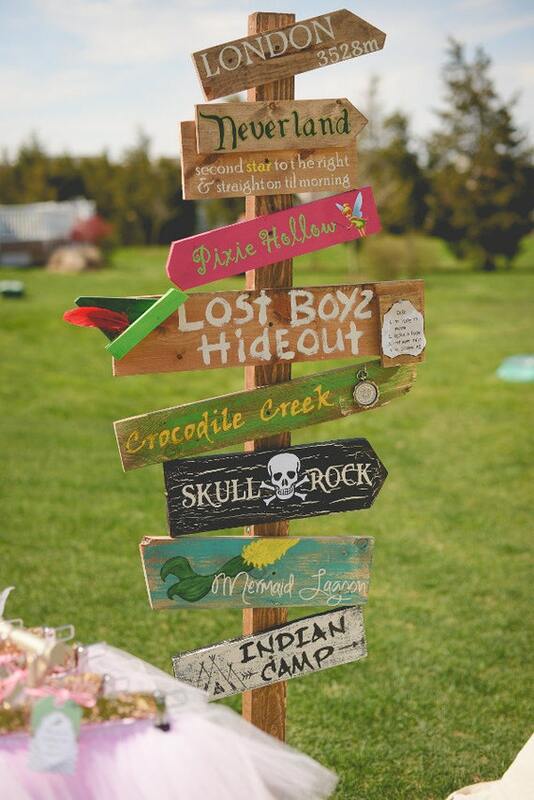 Now, some arty types out there might be able to create these from scratch but I know I could’t do it to the same standard and not without buying in some materials. As you can see it is a little bit different to the one on the website, ours came with a lovely starry sky background and if anything, I think it is nicer than the one the site! We decided to put the sign at the same height as the doorknob, rather than at the top of the door, so that Orla will be able to easluy see it as she gets older. We fixed it in place using the ‘No Nails’ Unibond tape which worked really well and means that there are no nail marks in the door. I am really happy with the end result, it’s just another touch of whimsy added to the house! Years ago Rob and I bought a table and dining room table set from a second hand furniture shop for a whopping £75! Score! Yeah, there are a few problems here. Firstly, I hate the fabric, and those huge big tacks, not a fan. This project was a team effort with me, Mum, Mary and Joanne working together….and Orla helpfully cheered us on! First we had to dismantle the chairs which took a lot of work. They were absolutely full of staples! We used screwdrivers, pliers and hammers to prise out each tack and staple one by one. Luckily it was a sunny day so we got to do the work outside in the garden. My hand was aching by the time we were finished! Eventually we had four empty chairs lined up on the grass, which my mum gave a good clean as I nipped out to the fabric shop with my sewing-fairy-Godmother Mary to pick up wadding. I’ve talked about Mary a lot on this blog, she is my wonderful friend and teacher, and finally here is a picture of her at work! We then recovered the seat with a layer of wadding and the new fabric. All the fabric came from Immanuel Fabrics in Burnley. The new covers were £12 for two meters and the felt was £2 for two meters. I had to do some hunting in the back rooms to find the fabric that I liked. I wanted a classic design in either blue or green, and it had to be strong enough to be used on chairs. Luckily Immanuel has nearly any kind of fabric you can imagine…you just have to find it! I love that shop! Mary and her daughter-in-law Jo stapled the seats together – Jo had the strongest hands for both staple removing and for staple fastening, she went twice as fast as the rest of us! We attached the backs of the chairs with more staples and then added a braiding (£1 per meter from Nelson Market) with a glue gun. Four upholstery tacks secured it all in place and we were done! Finally, the chairs have had the makeover that they so desperately needed and our dining room looks a lot tidier and prettier as a result! That’s another house job ticked off the list! It’s been ages since I did a garden post. 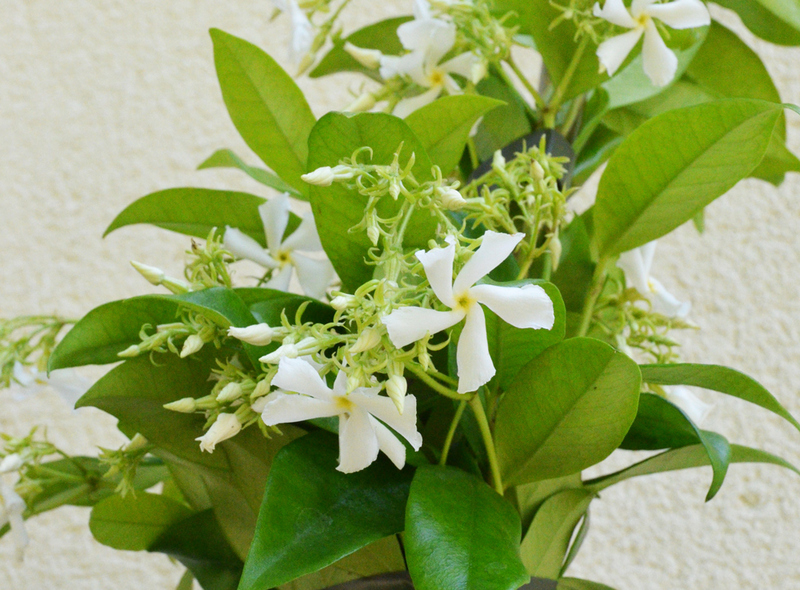 Here is what is happening in our lovely green corner. We have semi -deliberately only mowed part of the lawn this year. We only need a bit of the garden for picnic blankets and sunbathing, and it is good for local wildlife to have long grass. So our plan is to eventually create a meadow garden with paths running through it to encourage bees and butterflies. We are going to scatter meadow flower seeds each year and see what we get. Already we have a few good patches of clover which the bees love. In the actual flower beds there are a few pretty things in bloom. I love seeing the bright colours from the kitchen window when I am washing up. It looks like the apple tree is going to give us a full crop this year. I am determined to actually taste one. Last year the squirrels got to then first and we didn’t get to try a single one! The biggest change in the garden is that we have bought a new fence. The old one was barely standing and offered no privacy at all. A few times Rob had to rescue it from blowing into the road! We love this new fence, our garden feels more secluded and tidy now. Rob had been clearing the area around the fence of some straggly bushes. We now need to decide what to do with this reclaimed area. Any ideas? I love this tree stump and its mushrooms. I wonder if we could turn it into a little table or display stand? That’s what is happening in our half wild garden. I am really looking forward to trying out more ideas in there now that Órla is getting bigger. Today I have added a final touch to Órla’s Peter Pan themed bedroom; a fairy-dusted flying pirate ship! I am so pleased how it turned out because I have been planning this for awhile. I love that moment at the end of Peter Pan where Hook’s ship turns gold and the children fly home to London. When we began planning Órla’s room I spent ages online looking for a pirate ship light fitting but didn’t find anything suitable. Then last month I spotted this model in TK Maxx and knew it would be perfect with just a little bit of tweaking. I spray painted it gold, removed the base and asked Rob, ever so sweetly, to suspend it from the ceiling with fishing line, and voila! Órla had a magic flying ship for her bedroom. Now I just have to wait for her to be one enough to appreciate it! I have hankered for a tea trolley for awhile now. I loved the idea of having an array of spirits and elegant glasses nicely stored on a spindly brass trolley in the dining room. I imagined us finishing off dinners with a tipple or having a luxurious night cap before bed. Then I realised that accessible alcohol and a baby was not going to work. So my tea trolley dream was discarded. Plus I looked online and the kind of trolley that I wanted was ridiculously expensive. Then yesterday Rob and I went to Trawden Furniture Ltd in Colne for a browse and there in the car park was my dream tea trolley, and it was only £15! I had to have it! Look at it, isn’t it pretty? I have some idea about how I want to use it in the future, but for now I am happy to use it for making Grandma-chic afternoon snacks! We don’t do much eating around the table at the moment so at least we can enjoy a prettily laid tray! It also gives me an excuse to use my great-grandmother’s flower jug. I love the Spring colours! Makes me wonder why I don’t buy flowers more often, when they always make me happy! Anyway I am really pleased with this purchase and I can’t wait to show you how else I am going to use it! Stay tuned! Under careful instruction and encouragement from my mum, I am gradually becoming more green fingered….very gradually but it’s happening. The other week Mum and I worked on sprucing up two big white flower pots that were sitting forlornly on either side of our back door. I decided to take some step by step photos to share with you! 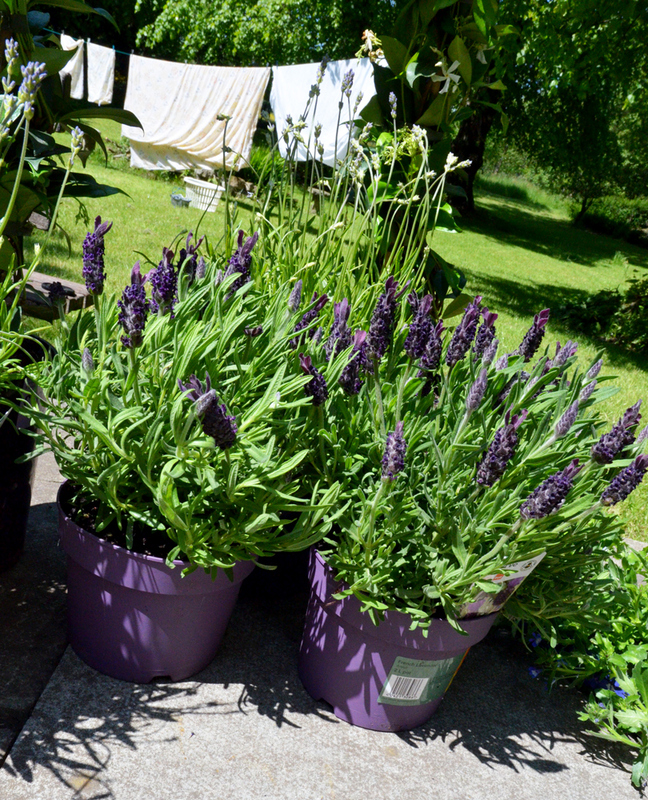 As these pots sit just outside our kitchen door I wanted something fragrant and had my heart set on lavender. 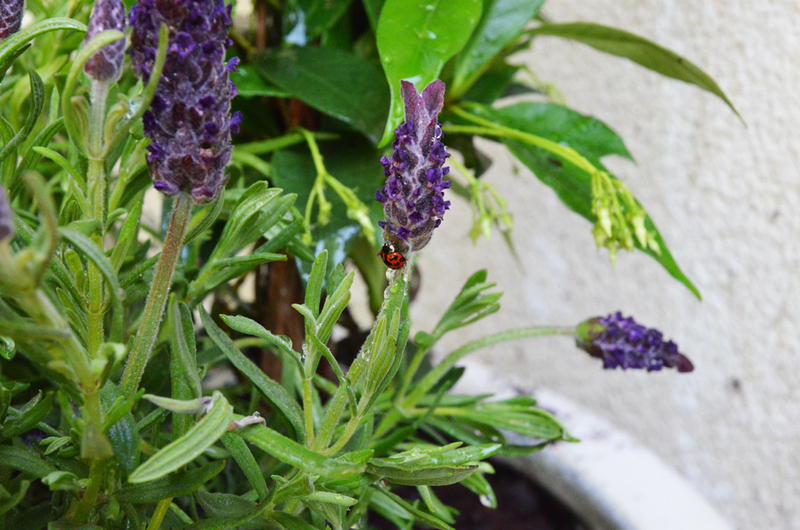 I love the scent of lavender, especially when you rub it with your fingertips, it’s like a free perfume. Mum and I hit B&Q and made a careful selection of two types of lavender, white jasmine and some little blue flowers whose name I can’t remember! 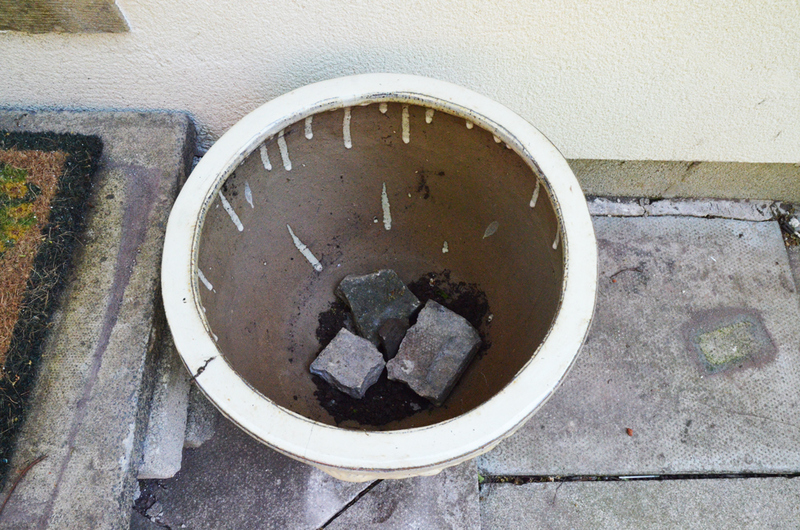 The first thing I learned about filling big pots like these is that you should put a couple of rocks at the bottom to partially cover the hole that allows water to run out, this helps the water to trickle through instead of pour straight through the bottom. 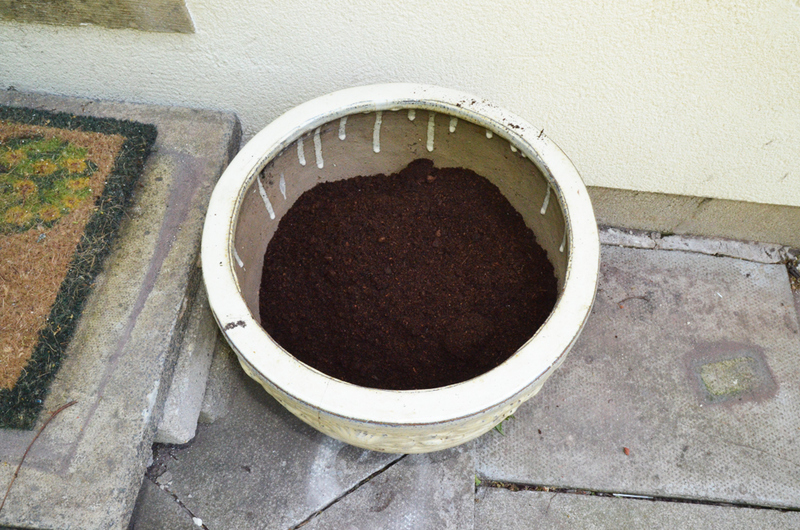 After the rocks, we filled it about three quarters full with freshly bought compost. Then it was a simple case of arranging the plants and topping up the compost. When arranging the pots Mum explained that it is good to use a variety of heights. 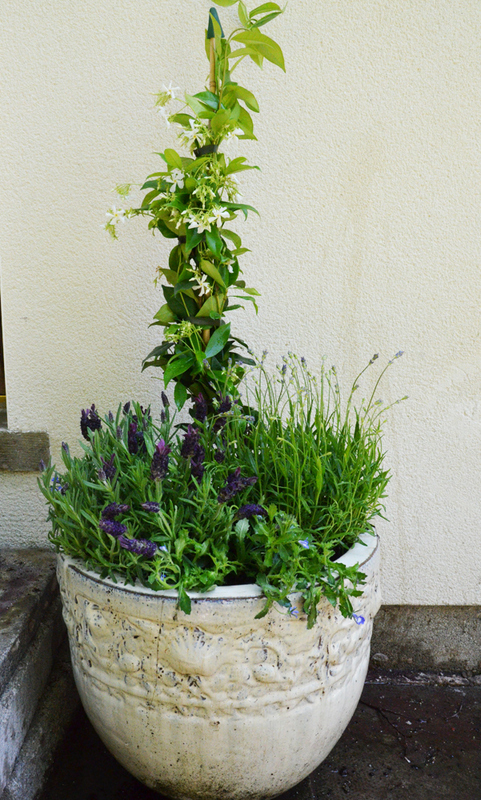 The Lavender is full and will fill the middle level of the pot, the white jasmine will grow tall and add height, where as the blue flowers will trail over the lid of the pot and grow downwards. It didn’t take long before the garden life found the new flowers! 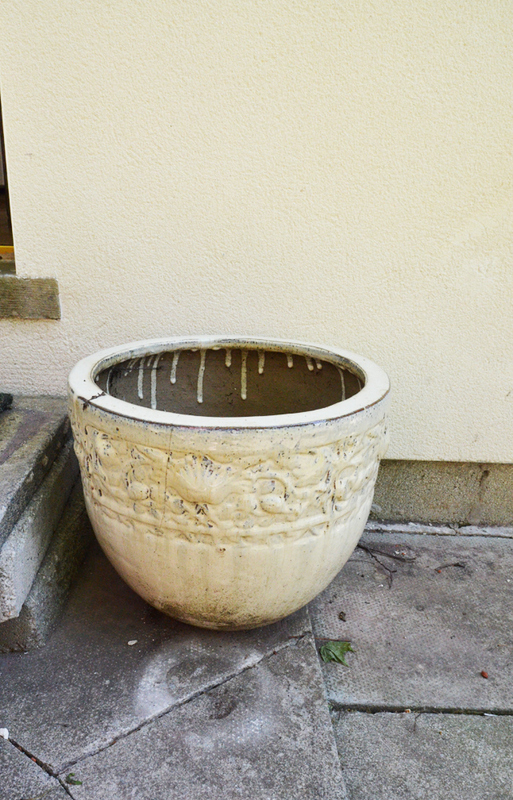 We gave the pots a good clean on the outside and then was nothing left to do but sit down in-between them and enjoy the sweet fragrance!